Back in 1961 my mentor Bobby Darin sent me to see Don Kirshner, who had just formed a publishing company, ALDON music, with music biz vet Al Nevins. I didn’t know it at the time, but when I signed an exclusive songwriting contract with them, I would be working around and learning from some of the greatest songwriters in history Goffin and King, Sedaka and Greenfield, Mann and Weil. I learned how to sing harmony from Barry Mann, how to make demos from Carole King, write better lyrics from Howie Greenfield and learned how to plug songs from the best…Don Kirshner! I remember Don would play the new releases for all of us. We’d analyze the hits then at Don‘s insistence, run off and write the follow up record! At every meeting Don would play a song that would become his Mantra…and ultimately his theme song ”I’m Gonna’ Be A Wheel Someday” by Fats Domino. 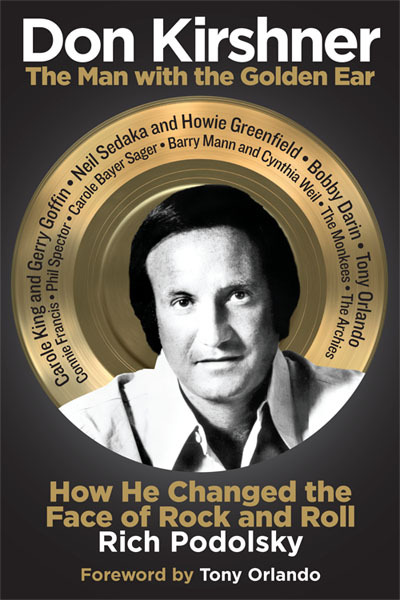 When author, Rich Podolsky asked me to contribute to his book “Don Kirshner, THE MAN WITH THE GOLDEN EAR”, I was not only happy to, but was also anxious to hear about what went on behind closed doors that helped shape the modern music business…I tell you I’m not disappointed! I’ll let Rich tell you himself. “When I sat down to write this book, it seemed like Don Kirshner had always been around. I first met him when I was 16 at a record industry dinner in my hometown of Philadelphia. That was 1962. He was only 27 but his song-publishing firm was the biggest thing in the business. Even back then I knew he had signed Neil Sedaka and Carole King and had started a revolution of teenage songwriting, but it wasn’t until years later that I understood why, and how he was able to achieve it. When I found out that Kirshner began his career writing songs with Bobby Darin, (when Bobby Darin was still going by Walden Robert Cassotto) I decided I needed to write this book. Kirshner, who had more nerve and guile than anyone, couldn’t understand why publishers (in the ‘50s) weren’t buying their songs. The answer was simply that those Brill Building publishers were playing it safe. They were more comfortable with the middle-aged songwriters from Tin Pan Alley writing fare like Perry Como’s “Hot Diggity (Dog Diggity, Boom)” that went to No. 1. They not only didn’t like the teens that were trying to sell their songs, they didn’t trust that there was a big enough market to support it. But Kirshner knew, because all of his friends were dying for more songs like those from Chuck Berry, Little Richard and the Everly Brothers. Kirshner’s vision drove him to open is own publishing firm and throw open the doors to all of that teenage writing talent waiting to be discovered. In the process he discovered and guided the careers of three of the greatest teams in history: Neil Sedaka and Howie Greenfield, Gerry Goffin and Carole King and Barry Mann and Cynthia Weil. Kirshner’s other great contribution to the music industry was creating and hosting the groundbreaking TV show, “Don Kirshner’s Rock Concert,” which ran for over a decade. Every time I ask someone about it a smile comes to their face. My theory is that they all have fond memories watching every weekend while getting high. It was the first long-form programming that didn’t feature bands pretending to sing. Live performances helped make it great. Don Kirshner, undoubtedly, had a golden ear. At 76, he died too soon, and in April he’ll be inducted into the Rock and Roll Hall of Fame, way too late. Politics kept him out, and now that he’s finally being inducted, the Hall’s silly archaic rules are preventing his family from making an acceptance speech. It seems they only allow living recipients to speak. Sedaka told me that when Goldner played Little Anthony’s record for him that both Sedaka and Goldner agreed it was terrible. “Why don’t you record it yourself,” Goldner suggested according to Sedaka. He did and the rest, as they say, is history. But just last week I saw Little Anthony and the Imperials perform in New York (and they still sound great). After the show I asked them what happened. “Goldner was out of town and the A&R guy decided to release another song instead, “ said Anthony. By the time Goldner returned RCA had already released Sedaka’s version. Live and Learn. There are always two sides to a story. Or was Sedaka rewriting history in his favor? There are a hundred other stories like this one in the book. Hope you all enjoy it.